It’s freezing, on and off raining and misty. I’m drenched and my boots are covered in a muddy sludge, a lagoon separates me from a stone face. 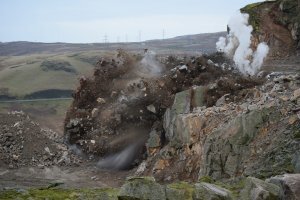 I’m at Montcliffe quarry to film and experience a blast- the extraction of stone from the stone face- accompanied by Sean Stewart the quarry manager. “Be ready” Sean says as I stand with my camera fixated on the blast spot. Once given the signal the blast would be instantaneous. A quick bang followed by a thunderous low rumble and it’s over. Impressive. Following the blast Sean insists that he takes me on a tour of the quarry, urged on by transport manager Sam Armstrong. Sam wants me to go and see her pride and Joy, she beams and muses over it as she describes it. 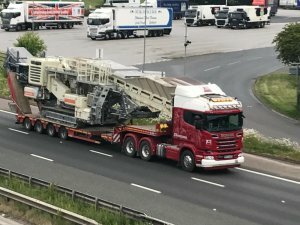 Our Scania R520 V8. Mayson. We drive around the quarry between piles of aggregate, roaming amongst the wheel loaders and excavators. Another thunderous low rumble vibrates through the air, but this isn’t another blast. The low rumble becomes louder as we come into a clearing. It is here I would lay my eyes on Mayson for the first time. However, the first thing I noticed about Mayson was not actually about Mayson at all, but instead its load. 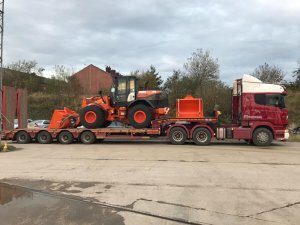 Loaded onto the trailer, by Mayson’s driver Simon Mayor, the Hitachi ZW310 wheel loader. A 22,400 Kilogram beast. A beast that was dwarfed by our V8. Simon has driven Mayson since the day we took delivery of the R520, and takes great pride in his wagon. 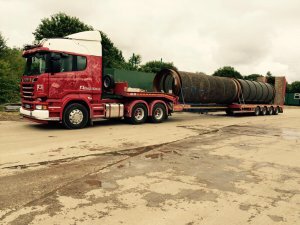 Simon is an experienced driver who moves lots of various loads such as; crushers, screeners, loading shovels, excavators, dozers and much more. Mayson is an R series V8 with 6×4 axle configuration and can gross an impressive 80 tonnes- the same weight as 3.5 Hitachi ZW310 wheel loaders! 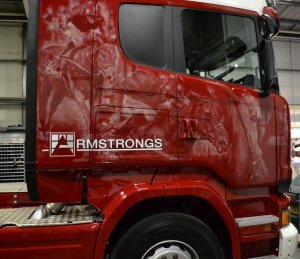 It is decked out in our iconic Armstrongs red, as well as unique airbrushing, and is the largest vehicle in our fleet. The powerful V8 engine with 520 Horsepower utilises the miller camshaft that reduces airflow through the engine at low load. The reduced airflow in turn increases the exhaust temperature, which helps to reduce the fuel consumption by 0.5 percent. At high load, compression work is moved out from the engine to the turbo compressor. More energy is extracted from the exhaust gases, which increases engine efficiency. This is possible because the inlet port is held open for a longer time and the effective inlet stroke is shorter than the expansion stroke. This will over-expand the in-cylinder gases, with more power to the crankshaft for the same amount of fuel. If you pay close attention to the front of our trucks you will see that they have names inscribed into them. They are the names of racehorses and our R520 V8 is no different. 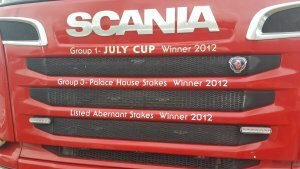 Adorned on the front of this massive cab is a short list of achievements- July Cup, Palace House Stakes, and Listed Abernant Stakes. This is Mayson- the V8 and the racehorse. The cab is a thing of beauty, decorated with various decals of Mayson celebrating his crowning achievements. Trained by Richard Fahey, Mayson went on to win the Abernant Stakes, the Palace House Stakes and the prestigious Group One July Cup. The July Cup win being especially impressive as a rank outsider at 33/1 he won by 6.5 lengths. Mayson now stands at Cheveley Park as a stud for his fifth season. However he continues to represent Armstrongs group through the impressive V8 engine that embodies the spirit and power of such a majestic creature. 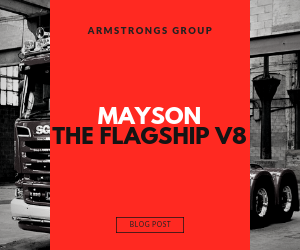 For more information on our fleet, the machines behind Armstrongs Group and more visit our blog section on the website. You can also follow us across Facebook, Twitter and Instagram @ArmstrongsGroup.